Your teeth and gums must be healthy enough to support a bridge to replace one or two missing teeth – this will be evaluated at the initial consultation where x-rays and other tests will be performed in order to ensure that we can build a bridge that will be functional and cosmetically acceptable for a number of years. The Traditional Fixed-Fixed Bridge has a ‘false tooth/teeth’ joined between two crowns to fill the gap left by a missing tooth. 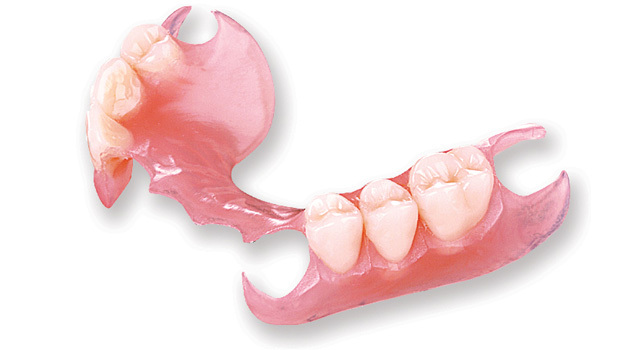 This type of dental bridge can be used to replace one or more missing teeth and is very strong and reliable. The Cantilever Bridge is used in areas of the mouth that are under less stress, such as your front teeth, as the ‘false tooth’ is only supported on one side. The result is just as aesthetic but has the benefit that only one tooth has to be treated. The Adhesive Bridge (previously named Maryland bridge, or minimal preparation bridge) is used where minimal or no tooth preparation is indicated (eg in a tooth with no fillings ) and a false tooth is attached to a metal wing or connector which is then bonded to the back of the tooth next to a gap. The wings/connectors are hidden from view so that only the crown is visible. This is a favoured option over the conventional bridge, as it is the least destructive to the adjacent tooth, maintaining its health and causing less impact to the life of that tooth. 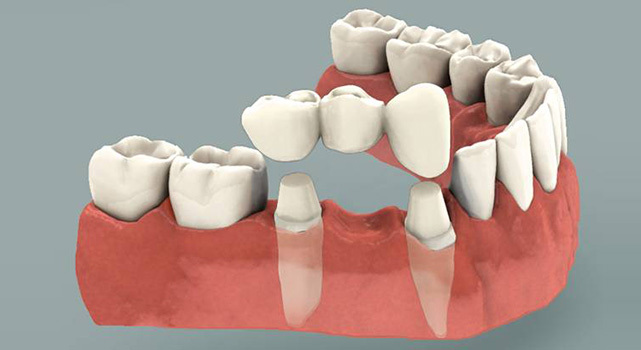 Implant Supported Dental bridges are the modern way to replace missing teeth. Implants are placed in the bone where the tooth roots would have originally been, and when they have fused to the bone a bridge is fitted onto them. Even if you have no teeth in one or both jaws, implants can be placed and a dental bridge securely fixed to them. The presence of teeth helps to provide a natural facial appearance, giving support to the lips and cheeks which can sometimes take on a collapsed look when teeth are missing. Dentures can also greatly improve the ability to chew food properly, aiding digestion and generally making meals much more enjoyable. We use high quality materials and work closely with our highly skilled local technicians to create a denture that is right for you- whether you are missing one tooth or all of them.